Well here we are in downtown Rockhampton. It's a cool evening and out on the balcony the evening breeze is soft and gentle. In here it's a little more airless - one of the next things I'll have to do is buy a fan so I can bring the breezes in without having to put the aircom on. The Everly Borthers are doing Wake up Little Suzie, but it's a guest spot on the Simon and Garfunkel Old Friends DVD. Hot damn but it's great fun, though. Tomorrow night there is a fireworks show to which the aforementioned balcony will afford good views, so a few of the people from the office are coming around with their families. That will be good. Because I'm not much one for my own company. Why take the job, then? Well, it's part of the journey of self-examination and doing different things, testing how well I can work in different environments and against new challenges. Of which I have a few. I reckon a lot of other people do it far more than I am - or have in the past, for sure - but sooner or later the urge comes on you (or you just wake up a bit about how the world works). Something I've noticed over the last few years is how much blokes my age actually are talking about this sort of thing. I always used to think it wasn't done - to admit you have insecurities was a sign of weakness, if you said you had ambitions or similar, you were a self-promoting wanker. Now it seems we - all us ageing blokes - find ourselves in similar situations, we are not in competition, we really don't have a lot to lose but we have a lot to gain amongst which is the comradeship of shared experiences. I've had this sort of conversation in different ways twice this week already. Inclduing one bloke who rang me about 15 minutes after we'd finished and he'd left, to give me his biggest insight gained from some recent decisions he had made. That in particular really blew me away, it's a form of honesty and a way of extending support that I don't think I've ever really run across before. I'm typing this on a laptop while sitting at a kitchen tables, the angles are all wrong and my neck is starting to hurt like crazy so I'll stop now. This has been a far more personal post than usual, but the world has changed in both big and smaller ways and it's only appropriate that Pied a Terre VVB respond in kind. Via the Hoyden and Baroquestar, here's a wonderful lolgillard. You know, I never cease to be just blown away by the imagination and ability of people - how do they come up with stuff like this? Just bloody terrific. This is likely to be the last post for a little while at least. I'm off to Rockvegas tomorrow and I will need to do some research about after hours access. There were a few internet cafes in Rocky last time I was there so I could always use one of those if the off-site access proves problematic. At the very least I can write a post of two when I'm back in Brisbane. I could also, I suppose, induct Mrs VVB into the delights of blogger and let her entertain you for a while. Hmm, not a bad idea, I'll suggest that one over dinner and see what kind of response we get. Today's blog round-up includes a fair bit of reflection, a lot of celebration and of course since Costello has announced that he's not in the race for leader, a lot of wtf? Not to forget the death of Matt Price, one of the few current journos whose writing I enjoyed. The Surfdomers and Lachlan Grods have steeled themselves to the unpleasant task of trawling through the world of RWDB for its response to Kevin!07, where the right is right and moreso if the government hasn't taken your guns away and the greatest threat that Australia faces is its imminent dhimmitude because the Labor Party hacked our voting machines. And you know, I could have sworn I felt an unseen force on my hand as my pencil moved over the ballot paper - that'll be the 'voting machine' - all by itself. "Is that you, Kevin?" I asked, to the extreme disquiet of Michael Johnson supporters to my right and left and further right. But no! My hand was turning green! What to do? I quickly found a sharp object (hint: paper cuts) and checked my circulation. Yup, still red. So I must be a watermelon. he could also perhaps drop the frequency of the "great Australian people" line - out the back door, perhaps? who promised to govern for all Australians in 1996? but it's a new dawn. Afterthought - I should have visited the Canberra Times before now. 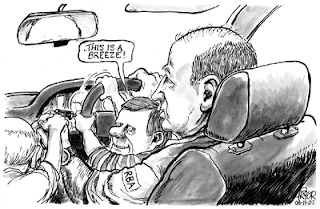 Geoff Pryor did his analysis and came up with this cracker of a cartoon. Given Mrs VVB's observations on Janette tonight, the panes on the left of the cartoon are spot on. It's only come out lately how much influence she has wielded and it's been of a particularly narrow, pernicous and socially regressive type. Also, this will be the last Howardia post. I think I recall making a commitment last night to just have an open post so that occasional readers could leave a comment. I expect nothing less than complete anonymity from these people - J@cQ$e! - and a tonne of insight. Can I also just thank certain people who bore with me bravely in a spirited endeavour to get utterly sh&tfaced, thus ensuring a good night's sleep for once. The last day in the Brisbane office for a while was also remarkable in many ways. If today goes the way that the sorts of people who hang around Chateau VVB hope, then the nature of VVB will no doubt change. Maybe lose a few of its...preoccupations...over the last nearly two years. Well, let's be honest, one preoccupation. The internetty access arrangements in Rockvegas may, however, prevent even a modicum of bloggery, but let's cross that bridge when we come to it. Well, the democratic duty is done. I've probably wrecked my reputation for good by shaking hands and chatting with one of the blue-shirted brigade at the polling booth, but he is my neighbour and he is also going to be useful to me in the Rockvegas job. While I knew very well that he was of conservative disposition, I didn't know he was actually a party member. However, it does explain his visceral loathing for Peter Beattie, easily equal to mine for Howard, whom he used to call the "blond Mugabe". Earlier, coming back from a couple of hours finishing up stuff at the office a couple of free coffees at the 'other office' - many of you will know where I mean - I was listening to the 1pm news. It seems that Deputy PM and leader of the Nationals, Mark Vaile, said he would go to church to pray for a Coalition victory this evening, before heading to Sydney to join his Coalition colleagues. If he wants to have a faith, fine. But he's going to pray for God to intervene after everybody has cast their votes? Ah, the Nationals, where would we be without their continuing comedy to enrichen our days? Had a complaint. Or maybe just a comment in passsing. Gone back to old template. I didn't like the new one either. Just seduced by the concept of change. Work triumph today. Feels good. Results in short sentences too, evidently...I'm still digesting it all. Isn't it great when a plan just comes together. Saturday, Saturday, Saturday, Saturday, Saturday, Saturday, Saturday night's all right. Or so it would - hesitatingly - appear. Well I've noted time and time again that Geoff Pryor in the Canberra Times is one of the most incisive cartoonists in this fair country. Check this one out: the facial expressions, the detail and finally, the message. If anything feeds into our preconceptions, this does. Well done, sir! We were going to have a Don's Party - as no doubt many around the country will be doing, albeit in hope of somewhat more felicitous outcome than in 1969 - but a few of the anointed ones have forsaken us. So no Phil's Party. The thought intrudes that, just maybe, they would have preferred a less...stressful...night out than having their host running to the TV and computer every 3 minutes and either whooping uncontrollably or throwing things, also uncontrollably. The best reason proffered has to be the couple, somewhat more committed Labor supporters than your 'umble scribe, one of whom dictates that they never go to parties on election night any more after a lifetime of Labor losses whenever they did. Mind you, they did live in the NT under several centuries of CLP rule. Enough to make anyone gun-shy, I guess. Actually, that was a very poor metaphor. Anyway, with a departure for parts central Queenslandian now scheduled for not too long afterwards, probably better that Mrs VVB and I don't spend the morning after picking bits of brick out of the television. It's not so much the actual outcome, as the commentary you have to endure from the panels in the tally room. One lot will be unbearably smug and full of hubris, the other will be desperately trying to polish the turd that the polls have dealt. Regardless of the outcome, the idea of listening to any analytical commentary by Nick Minchin is just a step too far - or far too many steps, to be precise. No doubt there will be a cornucopia of live blogging from which Chateau VVB will choose. Or we might retire early and hope to wake up in a brave new world. Here's the weekly column but instead of Jeremy we get Francie Clarkson. and I think it looks pretty. That’s actually true, it is pretty. But what I like even more than that is the combination of its manual gearbox, the enormous noise it makes and the way it handles. What a woman! What car-fancying bloke wouldn't give his left...er, ear...to be married to someone who (a) is so into car stuff, chasis dynamics even, and (b) can express it so eloquently. and wants one of these for her next ride. The Golf GTi - a really nice piece of kit, some friends have one and it was all I could do not to take it home when I saw it. So Mrs VVB has proven impermeable to the charms of Triumphs - lots of them - Pugs, various minis and their larger cousins, and the somewhat more reliable jap-crap. But now she's got it and, in the manner of Sellars and Yeatman, it is a Good Thing. 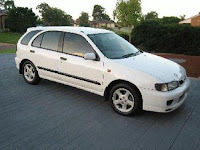 And it would be in place of this Pulsar - small, not particularly notable but it is the SSS version. (*) By George she's got it. For all our New Zealand readers. Via. Oh, and wasn't Dave Dobbyn fantastic on Rockwiz tonight? I didn't recognise his intro song but he held its final note for so long, not only did the crowd erupt but even the members of the Rockwiz Orchestra were open-mouthed. Following on from the previous post, I thought I'd cheer myself up by linking to comments and descriptions that have appeared around the traps recently. The point of this otherwise pointless excursion is to act as a reminder that the denizens of Chateau VVB are not alone, the species Howard-hater is more widespread than thought previously. I only hope that Rudd P.M. will see an end to the small minded mean spirited selfishness that seems to characterise contemporary Australia. of course this classic: What a slimy, self-regarding, small, repugnant, grub of a man. All you have to do is take a quick look (please don't linger) at Alexander "Little Lord" Downer's puffy, privileged face to quick-smart understand how depraved and far removed these born-to-rule-forever dandies are from their subjects. Out of touch? The very idea of being in touch makes them cringe with repulsion and contempt. On television last night the National Security Hotline commercial was on TV. 8 days away from a federal election. Originally badged as “Authorised by the Australian Government Canberra” it is now authorised “M Keelty, Chief Commissioner, Australian Federal Police“. Can there be any more transparently cynical attempt by Howard to get around the election advertising laws to blow the anti-muslim dogwhistle? In fact, is it actually legal for them to do this? (Emphasis added). John Howard’s plan is a big step backwards for Australia’s social cohesion. He still, operates — and thrives — on division. ...a picture of ministers keen to approve projects in Coalition electorates regardless of the advice of their officials and so sloppy in the way they went about it that they often didn’t even bother to record the basis of their decisions. In the comments on the piece (Productivity Coalition style) about the Regional Partnerships (ie 'partnerships with marginal seats') Program: With the nearly late government it is always hard to differentiate between acts of incompetence or mendacity. John Howard has led a mean-spirited, dishonest, arrogant, intolerant, cynical and unabashedly opportunistic government. John Howard has led a mean-spirited, dishonest, intolerant, cynical and unabashedly opportunistic government. 1 - As if we needed it, yet more evidence that this shameless pack of fascists seem to think they've been imbued with omnipotent authority. As if even the oft-claimed but usually spurious 'mandate' wasn't enough. 2 - but here's someone who comments on this latest lowest common denominator piece of bastardry far more eloquently than me. I tell you, we know we've lost a lot over the last 11 years but we'll only find out the full extent of how far good governance has been traduced once we've had sufficient, finely targeted inquiries with full judicial powers. As a country we deserve nothing less. "Snnnuurrr, snnurr, can you take the risk, can you take the RISK of handing over the economy to the Labor Party?" Listen you dickhead, Australia is a country. Get that? COUNTRY! It's filled with people. Citizens. (And some prohibited non-citizens, of course, so we have something to fear). You show me the economy and I'll give you a considered opinion about the risk of handing it over to anyone. Just bring it round to the leafy western suburbs, store it in boxes with little yellow tags on every one. These f**kers have to go. Not so much out of touch, not so much lost the plot, more like just complete.....do you know, I can't come up with an appropriate description? It's a combination of irredeemable stupidity, utter corruption, and overweening arrogance. Gotta do something about this burning anger. It's important to get your message out and, over the last decade or so, it's been important to 'stay on message' - it's all about the branding, folks. - finely tuned like a Formula One racing car? - or is it under threat of a global tsunami? Well, all this over the space of just a couple of months. That's the thing about globalisation, it just rushes up and bites you on the arse. Things change so flamin' quickly, you can't stay on message. Now, was this little tidbit the thing I thought ofthis morning about which to blog, or was that something else? Here's the quote of the day, from today's Crikey: "Political tragics like us grossly overestimate how interested and informed most Australians are about politics. Most would be aware, vaguely, that politicians promise a lot at elections and that some people reckon that's not necessarily a good idea. Beyond that, forget about it." Indeed. A work colleague went past the Labor policy launch the other day and, given it was all kinds of chaos and you couldn't get from A to B easily, was obliged to share some public space with a couple of young blokes, about 18 or so. They asked him what was going on, he said Kevin Rudd was launching the Labor's party's policy. Who's Kevin Rudd, they asked. 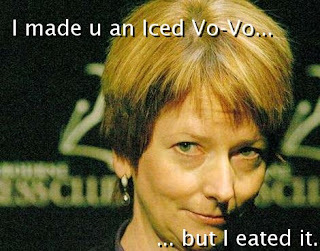 My mate replied, then said Rudd was running against John Howard. Hadn't heard of him either. Urban myth or maybe I misheard? Maybe. But if true, even a little bit? Informed voters, hey. Especially if they go to vote and the paper has neither Howard (of course, this is Brisbane) nor Rudd (possible, depends on where they live) on it? Assuming this pair can, read, of course. Anyway, there's bigger news. Your humble correspondent is off to spend a few months in the regions - Central Queensland, to be preciser. Should be good. More later. No! Not another John Howard post. Rather, that other line from the song, the one that starts it: "Everybody needs a little time away.."
I just have too much stuff going on right now and, like a lot of other people, I have had it up to here with the never-ending election. That said, while plenty have had it up to here, plenty more are still filling the bloggysphere with their opinions. As one will. Nup, it's just time to hang up the keyboard for a few days, maybe a couple of weeks. Now written, I believe, "a couple weeks." Rather like someone apologised for a mistake yesterday with "my bad." Snark, snark. That'll be the Lewis Carroll version, not the Walt Disney (tm). And snark again. Maybe come the weekend there'll be something useful to comment on. May the circle be unbroken - the blog post title you have when you can't remember the title you came up with earlier today when you had your regular Sunday morning read of Jeremy Clarkson. But what mainly appealed was the first comment. I love Poms (and by virtue of that comment I've just remembered the proposed post title). Anyway, the commenter is obviously doing pretty well to afford his Phaeton, and doesn't mind showing it, but there's just a little hint of tongue in cheek to make you think one and half times before moving on to...what's bad about labour market flexibility, in those instances where it actually results in some benefit for the worker. Can't have too much of that sort of thing going on, can we? Still and all, there's a better range, not to mention quality, of reading in the Times even if you don't agree with it, than the slovenly smearing of political enemies that passes for 'informed journalism' in this country. Puke. So here we are on Sunday evening, and all eyes turn to...Australian Idol. Yes, even here in the rarefied intellectual atmosphere of Chateau VVB we love a good dose of warbling as the week slumps to a conclusion. So who will go on the last night before the grand finale - Natalie or Carl? Then, via Freakonomics, we found Indexed. It's quirky and a bit uneven, but a little bit mesmerising nonetheless. I have nothing but admiration for people who are able to come up with concepts like this and pursue them. Aaah, on the TV behind me we have a scary ad about how Greg Combet and Julia Gillard who single-handedly brought the wharves to a standstill are going to "take over the economy." Presumably by retracting the Reserve Bank's Independence and reintroducing pattern bargaining. The fact that the wharves are now an effective duopoly - like many industries in Australia - and gouging exporters dry, is a bit beside the point. And that ad was immediately followed up by one for Ross Vasta in which he pledges to fix the roads, the parks, and so on - all local government responsibilities? What's Can-do Campbell doing, then? Finally, I went to bottle a batch of ginger beer today for Mrs VVB but the fermentation process had failed - air had got in somehere. Bummer. The advice is always to bottle anyway, but I only bottled half the keg as I didn't want to waste another hour bottling stuff that may have to then be thrown out. Via Today's apathetic youth, here's something for the apathetic oldies who occasionally hang around the Chateau. It's extremely funny. I'm looking at you, Hammy. Got to admit while I've heard of Andrew Sullivan and read a few of his columns, it was not until I read these two columns this evening did I get a feel for his political leanings and, it would seem, how they have changed as evidence seeps out that the democracy of the United States is in fact the dictatorship of not so much an eminence grise as an eminence extremely noire. That is to say, extremely black and nasty. You ask yourself how this can come about? Fairly simply, as checks and balances are stripped slowly away by a single political view being in power for two long - even when limited to two terms of office, in this case. Make no mistake, the abrogation of responsible government in the US and its apparent usurpation by malevolent forces, along with somewhat paler imitations elsewhere, is going to reverberate longer and affect our everyday lives more deeply than any real or imagined external threat. Short of this , of course. I haven't seen this story in the Canberra Times today picked up anywhere else. Compiling lists of expenditure in individual electorates should be the work of the appropriate Minister's office, based on lists of approved grants supplied by the relevant department. Sadly, the politicisation of Australian public services (oh sorry, I actually mean new managerialism, nothing political* about that) means that it is now seen as quite OK, in fact desirable, that the government's request for a breakdown on an electorate-by-electorate basis is seen as legitimate taxpayer-funded work. Making that info available to government candidates in marginal electorates? Dodgy. If only for political campaigning purposes? Wrong. Keeping the lists from public view because they don't add to the sum of understanding (after all, they just total up in different ways amounts already in the public domain): despicable. This country has been turned into a giant kleptocracy and it pains me to have to say that this, at least, is not all Howard's fault. The warning bells were rung a while ago, but of course the messenger got shot. Pryor in the Canberra Times does the cartoonist's job with insight and panache yet again. We can all get a good laugh from Howard and Costello's smarmy, arrogant sleights of hand but plenty will gobble it up like a sugary breakfast cereal. And regrettably, until the whole pendulum turns in about 300 years or so, and something closer to Fred Argy's refutation of Friedmanite economic orthodoxy becomes the new dominant paradigm, we'll only get a doppelganger's interpretation from Labor. We're all the poorer for it, of course, but we stopped living in communities and societies a few decades ago and the new reality that we all have to bow before the economy, wherever we may find it, has lots and lots of momentum. Individually, we just need to keep the faith with ourselves, our loved ones and our friends. Why, hello there little girl, is your name Pollyanna? Please excuse the cheap excuse for a stream of consciousness style, it must be because tomorrow's Friday and I've just come off another 13 hour day. Of circular motion, what fun. I'm sure youse can all fill in the gaps. (*) Apparently a song by Less than Jake. I can't believe I actually wrote dominant paradigm. I'm so 80s. Wow. Why don't we get this kind of stuff in Australia? "While technologically and financially you are giants, morally you are Pygmies..."
Given the common elements in these two examples, you can perhaps feel a little moral superiority when this sort of thing happens. As I type, the 7.30 Report on behind me is carefully deconstructing the Coalition's contradictory messages about 'economic management' and who might be 'better' at it. If you elect us your wages will go down and this is a good thing because it will contribute to the strong $1.1trillion economy that only we are capable of managing, but under Labor last time your wages went up which was bad because it led to inflation except that under the Hawke Accord your wages didn't rise as much they did under us over the last 11 years, so that was bad - or good, depending on which part of this sentence you are reading - also. Or possibly notwithstanding. But how do you get to be king? Anyway, I am very pleased that Chateau VVB's 24c (there's three of us here in the hacienda) a day towards the ABC is at last contributing to the growth, possibly from adult stems cells, of not only a backbone but also an appreciably latte-sipping, chardonnay-swilling anti-Coalition posture, with suitable questions, snarky comments and the occasional (but devastatingly effective nonetheless) raised eyebrow. That's what I'm talkin' 'bout. Anyway, enough of this frivolity. I hear the siren call of strategic intent, strategic overlays, almost certainly strategic strategies and quite possibly the strategy you have when you're not having a strategy. In other words, several more hours of pain on top of a full workday. Why do we do it? Anyway, there'll be half an hour off for Spicks and Specks. So here's Mal Brough on the 7.30 Report tonight getting all thing about a fence that separates an Aboriginal community from the rest of Darwin. MURRAY MCLAUGHLIN: Behind this fence is the Bagot community. It's appalling all right Mal. "Any persuasion". Indeed So that'd apply to the APEC fence, then? I imagine that's different. It's not as if a fair proportion of the community wanted to know what utter bureaucratic rubbish was being traded across the table in the rooms behind that wall. A greater proportion than wanted to do harm to the perpetrators. Pet hate of the week: the phrase 'rolling out'. As in we're rolling out broadband, we're rolling out a new product, we're rolling out services. Does it have wheels? If not, use the proper word, maybe 'make available', 'extend', 'release'. Bitter disappointment this morning when I went to timesonline.co.uk looking for my weekly dose of Clarkson. He's not on every week, and evidently this is one of the 'off' weeks. an inevitable Britney Spears story - all about the misuse of money, of course (more on this always fascinating subject in a minute). What interested me was in the comments where someone stated that (Spears) "smells nice". One can only assume that the commenter has been within sniffing distance. Bizarre, no? irate investors send death threats to a market analyst who downgraded their stock. There are so many angles to this story it's difficult to know where to start, so in the time-honoured way of Chateau VVB we'll make do with some off the cuff value judgements. First, it seems the claim that the stock market as the arbiter of all that is pure and influenced by government or any other interference may as well be an elephant on acid. With the undisclosed links between analysts, the firms they analyse and the inevitable imperfections in information between investors), I reckon it's more of a lottery than many people think already. Second, death threats? What is happening to people? You get a crime committed, may be something perfectly awful, and now we get baying mobs at the courthouse, screaming for a lynching. The veneer of civilisation is wearing pretty damn thin in places. Finally, she married a pro wrestler. And now he drinks beer from a glass. That's restoring the veneer of civilisation, yes? we still get. Answers on the head of a pin, please. Just like the recent protests in Burma and the inevitable crackdown by the ruling junta, Pakistan displays a history of feeble attempts at civilian rule interspersed with military dictatorship and suspension of rule of law, and it's just happened again. The British Foreign Secretary said they should embrace democracy, so we can confidently expect that to start on Monday. Simple, really. They say that previous behaviour is the best indicator of future behaviour: on this basis any ruler of Pakistan, whether civilian or military, is likely to overlook the needs of the people and do they want, safe in the knowledge that a few deaths is seen as the price. narrow Aussie tracks. The other thing is, just as the V8 Supercar race in China earlier this year, the stands are pretty well empty. Obviously they have a lot of money to throw at things in Bahrain and, I would imagine, fewer restrictions on government about where it gets thrown. Private money, on the other hand, always finds the highest and best use, or so we are reminded with infuriating regularity because, as this story shows value, like beauty, is all in the eye of the beholder. The Courier Mail today has a feature on John and Janette Howard at home. At Kirribilli, of course, thta's home. You need to keep the sick bag close by (much as you did with the piece on Kevin07 in the Australian colour mag a few weeks ago), but it does allow some telling insights. The PM and spouse are asked about whether they have politics-free times. And the answer, as if you didn't expect it, is "no, never". Which to my mind tells us why and how Howard has given us the government we had to have. His whole life is politics, we wanted to be PM since he was 10 (what 10 year old has any idea about the job and what he would do with it?) and he sees the whole world through the political lens. He has all the answers about how we should live, and it's only those pesky remnant bits of democracy that prevent him from ramming the whole kit and kaboodle down our throats. So, when asked about the death of Peter Andren, he makes a point about how well Andren did to be elected to the House of Representatives as an Independent. Not about what Andren represented or what he did. Rudd, after a short period of looking like a rabbit in the spotlights (I can see why people think he's plastic, it was like he was actually searching for what to say), talked about how Andren was a man of principle. Indeed. Such an answer should have come without a second thought, you'd reckon. And Janette has a bit of whinge about Kirribilli: if a large ship passes too closely, the doors rattle. There's a simple solution for that, m'dear - live in Canberra at the Lodge, where you're supposed to be. It'd also save us taxpayers a few shekels. Fortunately we don't have quite that level of undermining the Reason Project in Australia - not yet anyway. Here's something sort of different, just to cheer you up after that apocalytic vision - Jeremy Clarkson drives the Peel P50 - no, I hadn't heard of it either. Via The Spectacularly Obtuse Blog, so wonderfully named and to my mind what the intertubes are all about. How or why someone spends time looking for this sort of stuff is utterly bewildering, but I'm very glad they do. So I'm going between floors today, we have to swap lift lobbies in our building to do this between the low floors and the high floors. Into the lift I go with two young people, a stringy be-goateed bloke pushing a trolley stacked with boxes, and young girl who just looked a bit...alternative. They're talking about Mexican metal. As we get out of the lift at the lobby-swapping floor, I ask them what Mexican metal is. They look at me a bit askance: after all, I'm in my late 50s, grey, and without any features that might distibguish me as a Mexican metal fan. I'm Don Henley all the way, with everything that this brings. They look at each other, shrug, and the bloke says "Rodrigo y Gabriela". Then, "the 'e' is spelt 'y'". "I know," I respond, "it means 'and'". He looks at me like I'm an idiot - I get this frequently so it all washes off, but maybe one day I'll learn to be a little less patronising - and he says "Gabriela has only one 'l'". "Look them up on Youtube." So I do, and look what I get - this is bloody fantastic. Go there and look at some of the others. And of course you go to wikipedia and find out how recognised they are. But then at lunchtime I go to JB Hi Fi and buy this. And it's really good, too. Fogerty seems to have gone back to some country roots that weren't all that apparent in Creedence. I'm only halfway through the album, so far it's simple chord structures and some very familiar guitar work. Classic middle aged bloke music: after all the last CD I bought was JJ Cale and Eric Clapton, and it was very familar. In a world full of of phony, it's wonderful to hear a symphony. Especially when you can drink along. 9. I Ain't Never Gone To Bed With an Ugly Woman But I Sure Woke Up With a Few. And not only that, but an online thingo to help you do some international comparisons, using a variety of indicators, between various countries over time. There are lots of little tricks to play with - truly absorbing.